Sandy Wright discusses a concussion testing procedure with a research patient. Southern Medical Program student Alexander (Sandy) Wright has received the prestigious Vanier Canada Graduate Scholarship (Vanier CGS). The Vanier CGS program is designed to help establish Canada as a global centre of excellence in research and higher learning by supporting exceptional doctoral students. The scholarship provides $150,000 in funding over three years. Wright is working with Professors Paul van Donkelaar and Philip Ainslie at UBC Okanagan’s School of Health and Exercise Sciences, Dr. Alexander Rauscher at the UBC MRI Research Centre in Vancouver, and Dr. Bradley Monteleone, a Kelowna-based sport medicine physician. The student physician takes a multi-disciplinary approach to improving the understanding of and ability to diagnose and treat athletes with concussions. Wright joins a growing number of researchers attempting to zero in on the many unknowns surrounding concussions, including diagnosis, short- and long-term health impacts, and best approaches to clinical management. 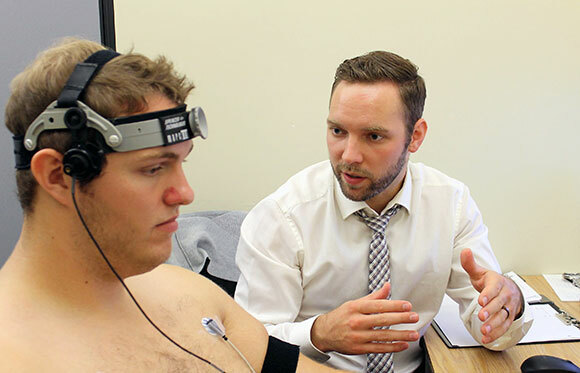 His primary research focuses on evaluating the links between head impact biomechanics in correlation to blood flow changes within the brain – a relatively new field in the world of concussion research. Wright and his research collaborators have recruited athletes from a variety of local athletic teams to assist with the study. Athletes are brought in at the beginning of the season for a series of baseline tests. First, a cognitive test measures and evaluates their current brain function. They are then assessed on numerous characteristics of blood flow control to the brain with the help of specialized equipment such as a transcranial Doppler radar device. Acknowledging the research is still in its early stages, Wright and his team are encouraged with their preliminary findings.